Shortly after academics slammed his "revisionist" view, defeated vice presidential aspirant Bongbong Marcos denied having said that the years of his father, the dictator Ferdinand, were the Philippines' golden age. But on the campaign trail last year, Marcos Jr. did fuel the myth by praising his father's "good work" which for him continues to benefit the people. The prosperity myth has endured for decades despite a peaceful revolution that drove the autocrat from power. Marcos supporters usually back their view with mini-narratives on the narrow peso-to-dollar conversion rate, growth in early Marcos years, free-flowing traffic, enthusiastic government spending and the country's regional competitiveness, among others. Experts such as Cesar Polvorosa Jr. of Canada's Humber Business School say, however, that economic performance under any given administration should be measured by the sustainability of growth and its benefits to the general population. "Other aspects of economic policymaking simply follow from those two major issues. Promoting economic growth enhances employment and livelihood opportunities," Polvorosa wrote last year. Economists from the University of the Philippines led by Emmanuel de Dios sought answers on the crisis felt then. Was it mainly an effect of external shocks, as Marcos supporters claimed? Was it because of the assassination of opposition leader Sen. Ninoy Aquino in 1983? Or was the downturn primarily due to Marcos' policies and abuses? "While the Philippines experienced more or less the same external shocks as other developing countries, there is a residual variation in its performance and response which makes it fall below the average for countries in its class," they wrote. In the 1950s, the Philippines was second to Japan in terms of per capita income in the region. The country enjoyed moderate economic growth alongside its neighbors while focusing on imports. A common anachronism today's apologists commit is to label this relatively prosperous time part of the "Marcos period." 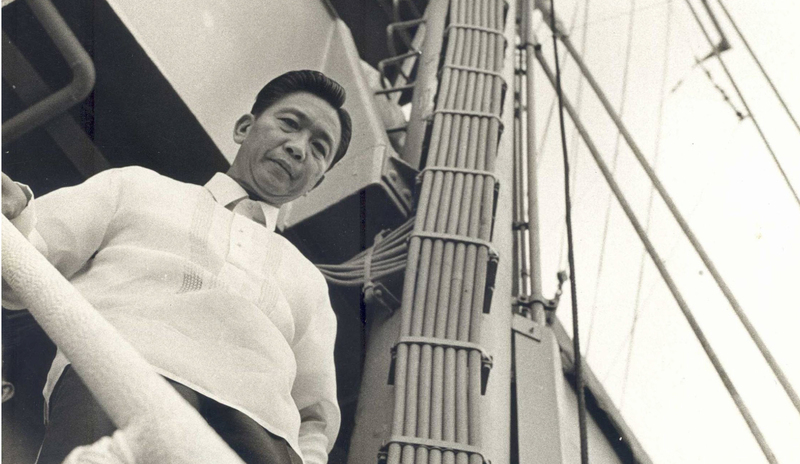 Marcos assumed the presidency only in 1965, when things started to spiral downward in the late 1960s as existing policies no longer encouraged rapid growth. The would-be dictator then pursued an aggressive, expensive run for a second term by foraying into the public treasury to boost his campaign, buy votes and threaten voters. 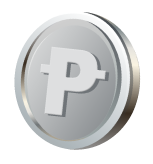 The peso crashed in late 1969, and by the dawn of the following year it lost half its value, Conrado de Quiros wrote in "Dead Aim." 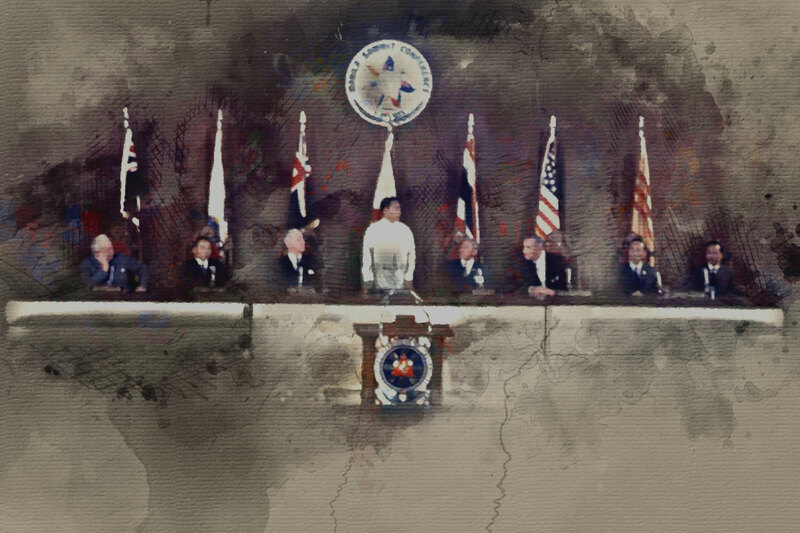 The 1960s crisis, for economists Arsenio Balisacan and Hall Hill, "was triggered by one politician's particularly shameless efforts to maintain a grasp on the reins of the political machinery." Among its peers, the country could no longer keep up. "While the Philippines started with the highest growth rates for [Southeast Asia] in 1950-1960 (3.6 percent annually), it lagged behind its neighbors in 1960-1970," economists De Dios, Dante Canlas, Solita Monsod and their fellow U.P. economists wrote. In 1961, the poorest 30 percent had an 8 percent share of total income while the richest 20 percent garnered 56.6 percent. In 1971, a year before the declaration of Martial Law, 5 years in to the term of Marcos, poverty incidence was at 52 percent. At the end of his rule, 59 percent of Filipinos were poor. The income share of the poorest 60 percent of the population went from 25.0 percent on 1971 to 22.5 percent in 1978 while the income share of the richest 10 percent went from 37.1 percent in 1971 to 41.7 percent in 1979. Unemployment went from 5.2 percent in 1978 to 5.9% in 1983. Underemployment went from 10.2 percent in 1978 to 29.0 percent in 1983 and 36.4 in 1984 to 28.4 in 1986. The Philippine GDP per capita from 2011 to 2015 was 4.24 percent, Malaysian 3.7062, Thai 2.4958, Indonesian 4.1742 and Singaporean 2.1802. The GDP growth rate from 2011 to 2015 was 5.9062. Debt-to-GNP ratio from 2010-14 wa 49.90%. Poverty incidence went down from 26.6 percent in 2006 to 25.2 in 2012 to 21.6 in 2015. The income share of the lowest 20 percent in 2010 was slightly more than 5.9 percent while that of the richest 10 percent that year was at 33.6 percent. Unemployment was at 6.9 percent from 2010-15. In October 2016, underemployment rate was at 18.0 percent. "The trouble with debt-driven growth with populist tendencies is that it produces a buoyant economic environment—at least in the beginning. As long as the facade of investment for competitiveness is still there, then investors continue to pour money into the economy, which keeps it growing," Harvard-trained economist Ronald Mendoza, dean of the Ateneo School of Government, explained to Philstar.com. "Initially, it looks very good," Mendoza admitted. "It doesn't take rocket science to figure out that the country's debt-driven growth was a party that would soon end, once investors figured out that despite the mounting debt, the country failed to effectively invest in key infrastructure and competitiveness-enhancing projects." The 1970s saw the kind of progress without momentum. As then Social Security System chief Adrian Cristobal told Harvard University fellow William Overholt, "It was like an old lady taking off her girdle. Everything just fell out." The regime's initial reforms turned upside down as institutions bowed to corruption, red tape, inefficiency and Marcos-led cronyism. His development strategies and trade policies were likewise incoherent, not to mention the padding of debt mainly for a gamut of projects that required large funding despite little gain. It was typical for Asia-Pacific countries to spend $2 to $4 to raise national ouput by $1. But the Philippines was spending $9 for every dollar. "External factors could help trigger a crisis; but domestic fundamentals (or the lack of it) will dictate resilience to these external shocks. For the most part, I think the crisis in the Philippines was largely man-made—the external shocks merely exposed them," Ateneo Dean Ronald Mendoza said in an online interview with Philstar.com. In 1983, Aquino, the staunch Marcos critic, returned to the Philippines from exile and was killed on the tarmac as he alighted from the plane. As a result, foreign banks lost confidence in the regime and refused to grant further borrowings, De Dios wrote. This explains why Martial Law advocates to this day blame Aquino's return and death for economic misfortunes in the latter Marcos years. "All it took was a crisis to expose these weaknesses and for the facade of democracy to unravel." For Mendoza, the senator's assassination played a role in triggering "what was already a simmering political and economic crisis." 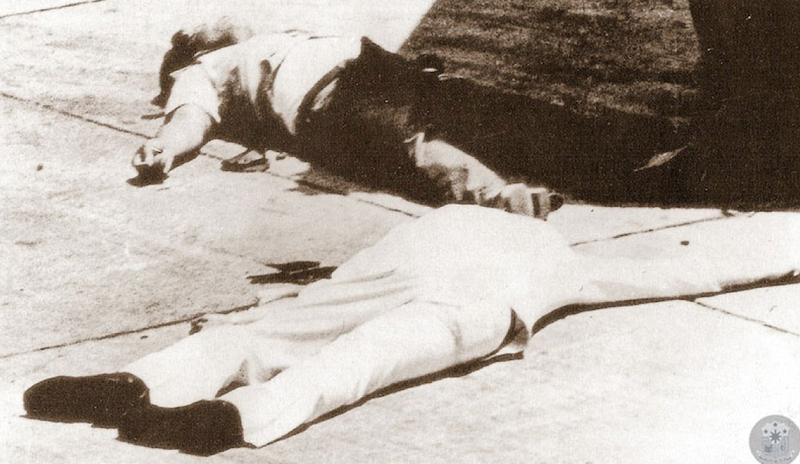 "But if it wasn't the assassination of Ninoy, it would have been something else, perhaps." "All it took was a crisis to expose these weaknesses and for the facade of democracy to unravel," Mendoza said. Tasked to recover what was believed to be the strongman's hidden wealth, the Philippine Commission on Good Government set to work by going after agents working for Marcos in the Philippines and abroad. The PCGG was among the first bodies President Corazon Aquino formed after Marcos was overthrown through "people power." The Jovito Salonga-led commission uncovered a trail to what appeared to be vast assets of Marcos "stretching from a small Texas motel to a San Francisco bank, from a glitzy Manhattan shopping mall to a block of apartment buildings in downtown Seattle," the Los Angeles Times reported in 1986. 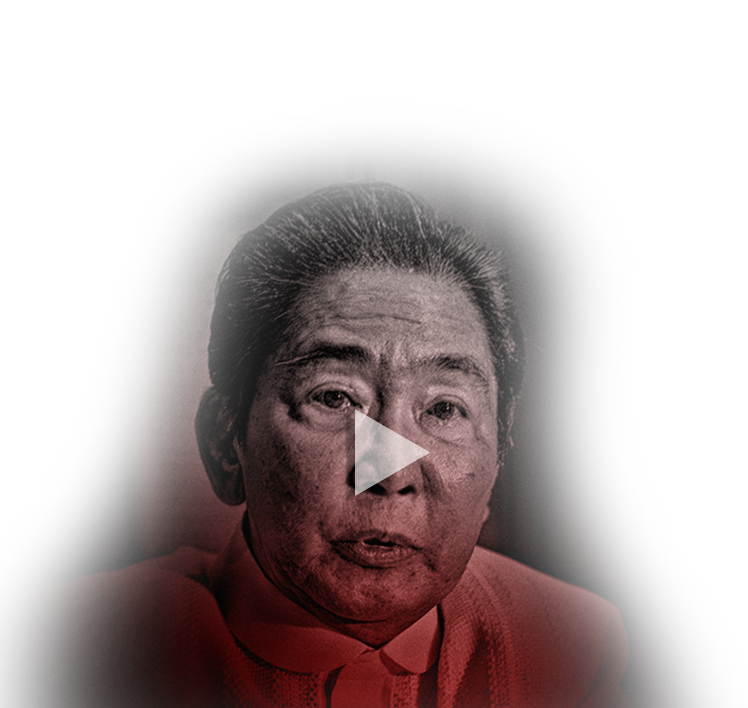 As dictator, Marcos wrote letters of instruction and decrees to position his cronies—as his associates came to be called—to set up monopolies of key industries. Even as he gained popular support for attacking the ruling class he called the "oligarchy," Marcos ironically created a loyal new elite controlling the country's largest enterprises. "Some are smarter than others," Marcos' wife, Imelda, famously answered when Fortune magazine asked her about relatives and friends who grew rich during the period. Loyal Marcos backer Roberto Benedicto took over the lucrative sugar industry, while Eduardo Cojuangco led a powerful crony corporation sitting on taxes from coconut farmers. "By the 1980s, the 'coco levy' would become one of the major issues against the dictatorship, the term connoting its most rapacious aspects," wrote business journalist Rigoberto Tiglao in 1988. Historian Alfred McCoy said Imelda's brother, Benjamin Romualdez, took control of P5.7 million in holdings of the influential Lopez family, including the largest power distributor Meralco, newspapers and television studios, for a mere $1,500. Women started to seek jobs in the mid-1970s due to the decline in their husbands' income. 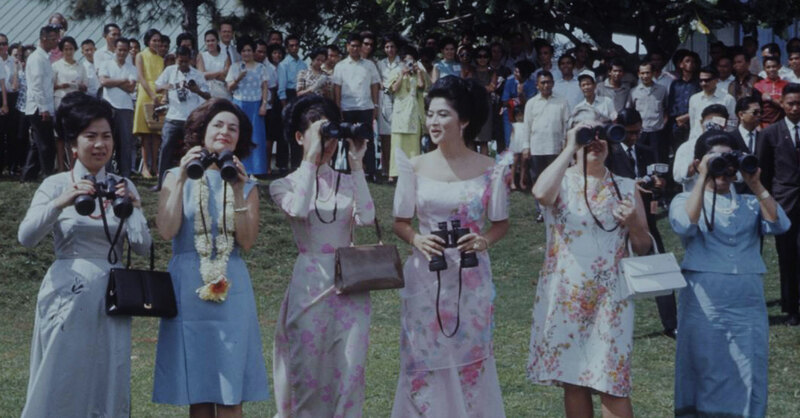 Some Filipinos today recall that life was "simpler"—even better—during Marcos's years. But these anecdotes are nowhere reflected when looking at the hard data on the population's welfare. Shifts in employment in those years get even interesting. De Dios and fellow economists observed an "unusually high" expansion of labor supply, or the number of people available for work. This was due to housewives who started to seek jobs in the mid-1970s—a phenomenon attributed not necessarily to women empowerment, but to the decline in husbands' income below what used to be enough for their families' subsistence. 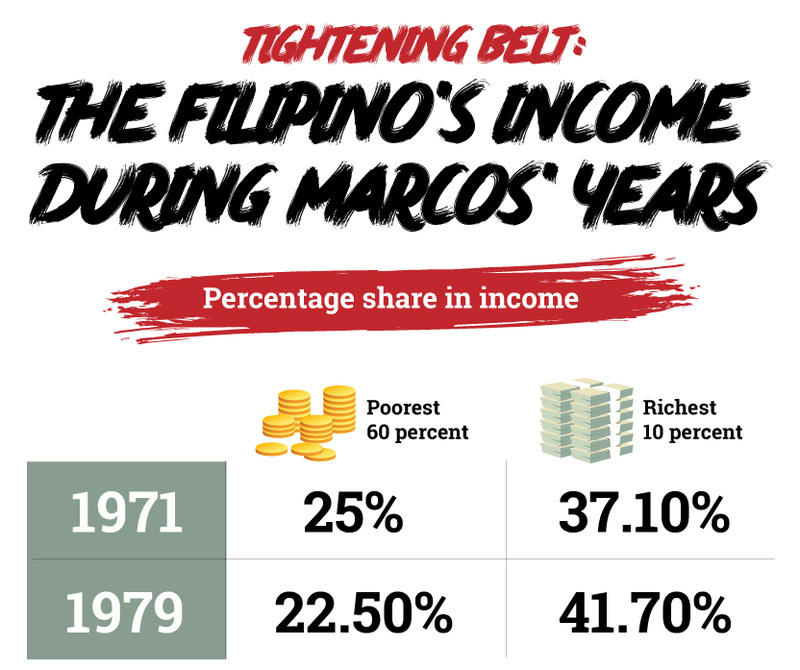 The economy today is dramatically better than the Marcos economy; but without inclusion, many of our citizens probably can't tell the difference. 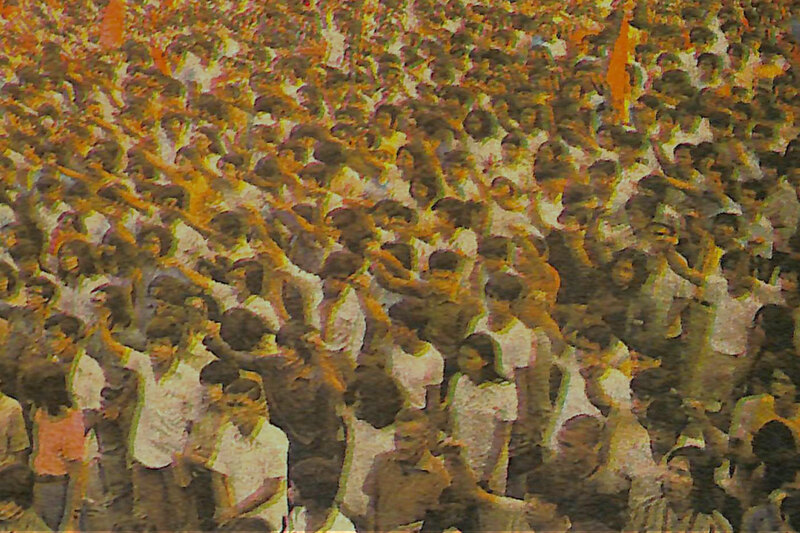 This was partly ascribed to roiling external conditions, but a comparison of the Philippines' performance with those of its neighbors suggests that high inflation rate and lower economic growth "could have been avoided and could be attributed, not to the general problems of a developing country, but to the character of the policies of the present government," De Dios and colleagues explained in 1984. If a critical measure of an economy's performance is its trickle-down effect, then the Martial Law enablers miserably failed. "I think the Marcos myth persists largely because we have failed to effectively push in the Post-Marcos era the key or deep institutional reforms, notably political and economic reforms that could make our politics and economy much more inclusive," Mendoza explained. "Understandably, many are tempted by shortcuts and strongman rule, instead of faithfully building the institutions that could strengthen our democracy and economy. link Tasaday: Fact or fiction? Was it an age of prosperity under Marcos? Was the economic disaster mainly an effect of external shocks? Was it because of the assassination of opposition leader Sen. Ninoy Aquino in 1983? Or was the downturn primarily due to Marcos' policies and abuses? Some are smarter than others.